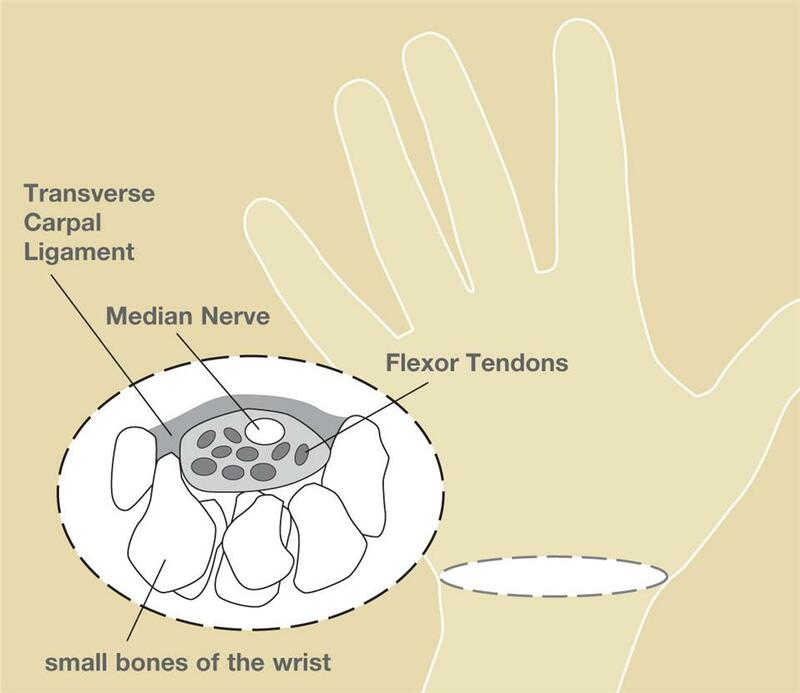 Carpal Tunnel Syndrome (CTS) is a common disorder caused by compression of the Median Nerve at the level of the wrist. The nerve travels under the Transverse Carpal Ligament along with nine tendons which flex the fingers. It typically results in classic symptoms of numbness and tingling in the thumb, index, middle, and ring fingers. These symptoms typically present themselves at night and patients will report waking up with the numbness and tingling. It can also occur during the day with certain positional activities such as driving a car, using the telephone, or blow drying one’s hair. Occasionally pain which radiates up the forearm can be present. The onset of the disorder is usually slow with worsening of the symptoms occurring over months to years. When CTS is severe, it can affect the muscles which move the thumb and even lead to permanent loss of sensation. The cause of Carpal Tunnel Syndrome is typically unknown but is sometimes caused by fractures, cysts, or other swelling about the wrist. Some conditions such as rheumatoid arthritis and pregnancy can also be associated with CTS. A detailed history and physical exam by a hand surgeon is important for the proper diagnosis of CTS and to rule out any separate or related problems. Typically a nerve conduction study will be performed in order to confirm the diagnosis of CTS, determine severity, and rule out other potential sites of nerve impingement. Conservative treatment should first be attempted with night time wrist braces for at least 4-6 weeks. Physical therapy or cortisone injections may also be recommended on a case by case basis. 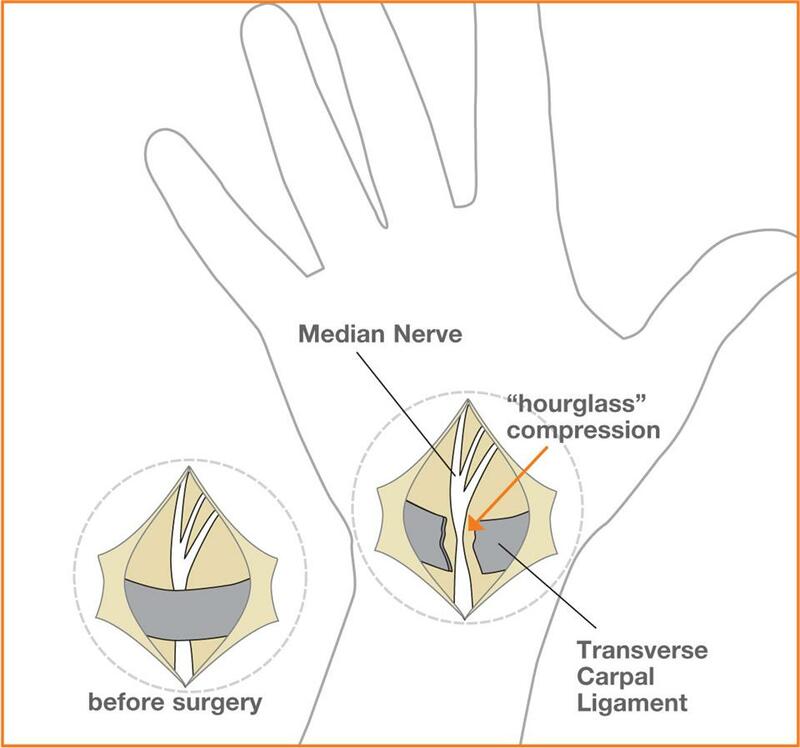 If non operative treatment is unsuccessful, a small surgical procedure to take the pressure of the Median Nerve can be performed. This can be done under local anesthesia or local with some light sedation. General anesthesia is unnecessary. The procedure takes about 15 minutes and is performed at an outpatient surgical center. Sutures are removed at about 10 days. Activities of daily living can usually be performed with minimal discomfort within a few days. Some soreness in the palm can remain for up to 4-6 weeks. Return to work is dependent on each patient’s job description.